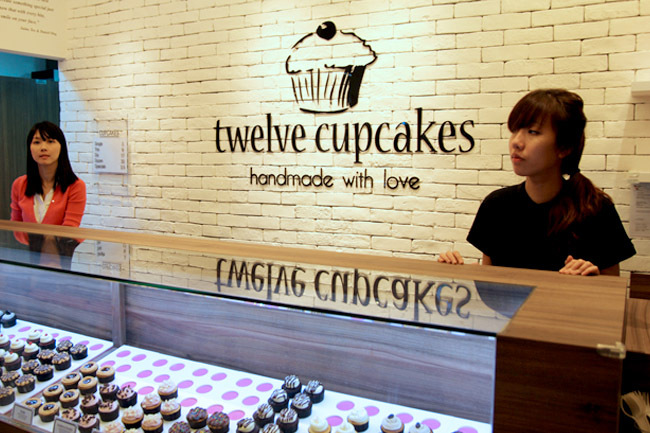 Twelve Cupcakes was founded by Jaime Teo and Daniel Ong – the celebrity couple who met on the set of Mr Kiasu, got married, had a kid, and opened 4 cupcake shops. 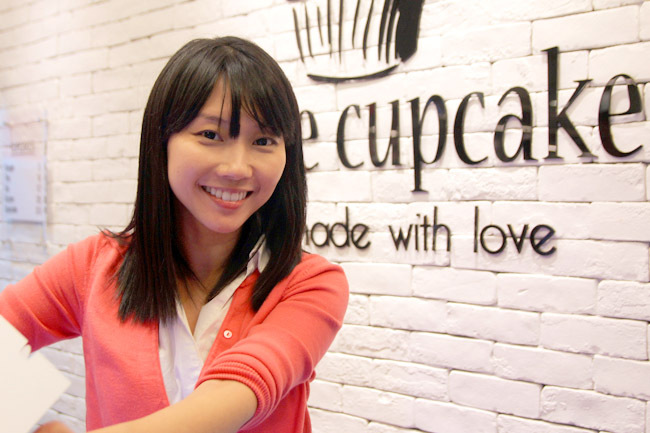 Their cupcakes had earned very positive reviews from critics, fans and friends, with some saying this is probably the best cupcake found in Singapore. When I received an sms from Chef Willin Low saying “Yoz! Just walked past bugis junction n saw ur new place!! Congrats man!!! So happy for u guys!”, I knew it was a case of mistaken identity again. I am Ang, the famous Ong married Jaime. But Daniel Ang knew it was time to visit Jamie, to try her so-wonderful Rose on a Rose cupcake, and to share with everyone this exclusive candid interview. Hi Jamie, why Twelve Cupcakes? Not Nine, Ten, Eleven? If you noticed, there are 12 holes in a baking tray. And 12 is a very auspicious number? Let’s see. There are 12 signs in a horoscope, 12 animals in the zodiac calendar, 12 months in a yea…And 12 numbers on a clock. If you are a bowler, 12 strikes equal a perfect to a perfect game. And Daniel used to bowl quite often. You have opened so many branches of Twelve Cupcakes in a span of one year. Congratulations! Yes, response at the first outlet was overwhelming, so much that we felt the need to cater to more customers and also grab hold of the opportunity. Opening a shop is not easy. There will be so many things to do. How do you manage? Daniel will be helping with the admin and paperwork, while I keep myself busy in the kitchen. You are a superwoman! You need to oversee Twelve Cupcakes, ‘take care’ of Daniel and your kid, plus host gigs with Fly Entertainment. Actually, the husband and shop are quite manageable. Hahaha. It is being a mother which is the most challenging –there is no rest time. A mother is on standby 24 hours a day. You have such multiple roles. You were Miss Singapore Universes, an actress, host, and even a singer with the pop group One Fifth. Oh yes, I remember the song “Ai De Man Dong Zuo”. Few people know you are in fact a food blogger! And hosted many other food programmes. If you would want to introduce one F&B shop, what would it be? 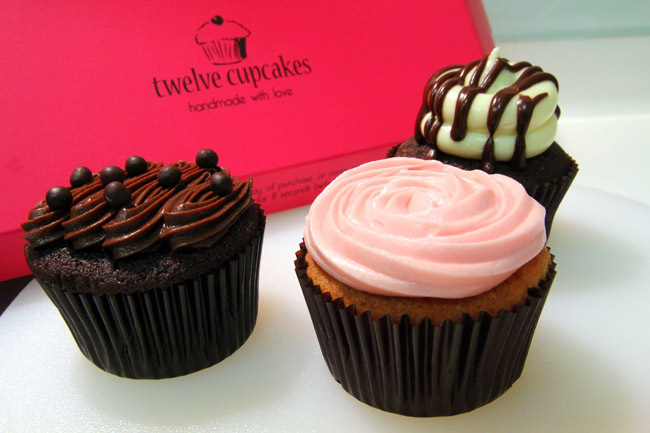 I didn’t know about this shop till I opened Twelve Cupcakes at Millenia Walk – Pullman Bakery. I get to buy the freshest items because my shop is nearby. My recommendations are raisin milk bread and Danish roll. Do you know females like to eat bread that are longer in shape because they are less messy? And the ingredients such as the sausage do not feel processed – very gourmet in fact. Let’s talk about your cupcakes. If you can recommend only one flavour, what would it be? The Red Velvet. Customers go like “Wow, so pretty”. Its charm is that it is not too sweet and fluffy. Customers also like fruity cupcakes, such as the mango, lemon and lychee flavours. How about Daniel? Which flavour does he like? Daniel is a model husband – he is very supportive and eats EVERYTHING that I bake. He is the one who persuaded me to open a shop like this. Where do you learn how to bake these delicious cupcakes? The truth? From the internet! But I experimented with many versions because many online recipes are too sweet. Thank you Jaime. Can I take a few photos? Sure, but please please upload only the pretty ones. When I first visited Jaime, I was kind of surprised to see her wearing her nerdy specs, face slightly covered with baking flour, wearing an apron… kind of like a housewife – very unlike the glam Ms Universe look she portrayed on televison. But what I saw was her determination. She was really in the kitchen icing all the cream, making sure every cupcake looks perfect and to her requirements. Surely being famous did help her in the business, but we also know of many other celebrities who failed in F&B business. And this girl really works hard. She looks a liiiiiiitle bit like Dawn Yeoh (or should i say the other way round) in these photos! Oh and I didnt know that she was part of a girl group! Love her PB chocolate! Thats my fav! i went to their outlet at IMM today and Daniel Ong and Jamie was there! I was awestruck!!! Since I took the photo and conducted the interview, I am pretty sure it is her.